Oh My Aching . . . If you have the time and space, consider planting more vegetables. Read the seed packet to determine number of days to harvest. Some short-term seeded crops include radishes, summer squash, green beans, cucumbers, turnips, and rutabagas. Be aware of ticks. To learn more about ticks in Maine and how to identify them, see UMaine Extension fact sheet #5047, Ticks, or Maine Medical Center’s Lyme and Other Vector-borne Disease Information or Maine.gov’s Tick Identification. Get ready for possible irrigation of your garden(s). There typically seems to be a dry time in each Maine summer. For more information on home garden irrigation, see Bulletin #2160, Trickle Irrigation: Using and Conserving Water in the Home Garden. Evaluate your landscape. What plants are thriving? What plants are struggling? What issues or problems need to be addressed? Are there spaces in your landscape that can be improved? Stake peonies to support and promote upright growth. Make arrangements to visit a neighbor’s garden, a local community garden or a public garden for the purpose of learning something new about growing fruits, vegetables, herbs, flowers, shrubs or trees. Be aware of pest pressures in your yard and garden. Make weekly observations of plants. Observe general plant growth, leaves, stems, and shoots. Look for damage, egg masses, insects, disease. Also be on the look out for beneficial insects. If wildlife was a problem for your garden or trees in the past, consider protecting your plants with fencing or repellents. Watch for possible wildlife damage to your gardens and landscape. Determine the identity of the culprits. Learn their behavior, make a list of strategies to prevent damage, and create and follow a suitable plan. Be steadfast in preventing and controlling garden weeds. Regular efforts make a big difference. Tilling, hand pulling, clipping, and mulching are sound weed control strategies. Learn about the weeds that are troubling your plantings. See Michigan State University’s website for information on turf weeds. For general yard and garden weeds, see Rutger’s weed gallery. 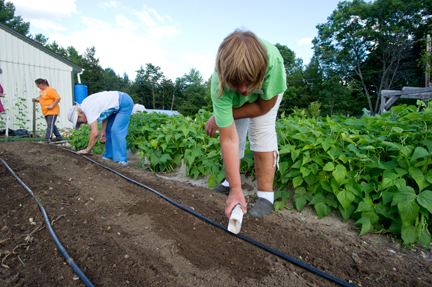 With the increased awareness of local foods and health benefits, home gardening has become a popular activity. In turn, the number of gardening-related injuries has increased. These injuries can be attributed to increased strenuous activities over the weekend — the endearing term “weekend warrior” comes to mind. Improper work practices while gardening may make it difficult for you to enjoy your favorite past time. Before you head out to the garden consider your most important tool — YOU! Stretching warms up your joints and muscles to make your gardening activity more enjoyable. Download the Farmer Daily Stretching Program from the University of Nebraska Lincoln Extension website for examples of stretching exercises. You can also help prevent injury or undue stress while working in the garden by listening to your body. Respect pain — it’s a warning signal that something isn’t right. Be mindful of your posture while working; poor posture can lead to fatigue and strains. Avoid staying in one position too long by switching tasks routinely — bend, stretch and move around to avoid stiffness. Likewise, repetitive motion activities can lead to injuries or strains. Mix it up while working — weed, hoe, enjoy! Being safe also includes being aware of pinch points and cutting edges — wearing the appropriate protective gear while working, including sun protection. Beware of carrying loads that are too heavy, use assistive tools such as wheelbarrows, and proper lifting techniques. Ergonomically designed tools are becoming more popular and are widely available. These tools are designed to keep the body in neutral positions to minimize stress on joints while maximizing power with less energy. Ergonomic tools are generally made with large, soft handles to allow you to get a better grip on the tool while reducing vibration and slipping. The tool should also have a depression or ridge on the top of the tool for your thumb to rest against. This will assist in keeping your wrist in a neutral position as you work. Spring loaded or power assist tools will make your job easier and faster while longer handles on tools will allow you to reduce back strain and increase leverage, which requires less strength. Also consider the weight of the garden tool; most are designed for men, but some are designed especially for women. Lightweight or telescoping tools can extend your reach and reduce strain on your back or awkward reaching positions. Tools can be adapted at home with the addition of PVC piping to lengthen the tool, and additional handle or “D-grip” for a two-handed grip or adding foam insulation to pad the tool. Adapting your tools or garden space to allow you to work upright will reduce back strain and muscle fatigue. If you are one of the many affected by arthritis, gardening can be an excellent therapy to help maintain flexibility, increased range of motion, and increase your quality of life. The Arthritis Foundation has excellent resources available. Employing safe gardening work practices with a focus on basic ergonomics may help you continue to enjoy gardening the whole season long. Links to other websites are provided purely for educational purposes. No responsibility is assumed for any content on the linked sites. No endorsement of products or companies is intended, nor is criticism of unnamed products or companies implied. June is an active time in an orchard. 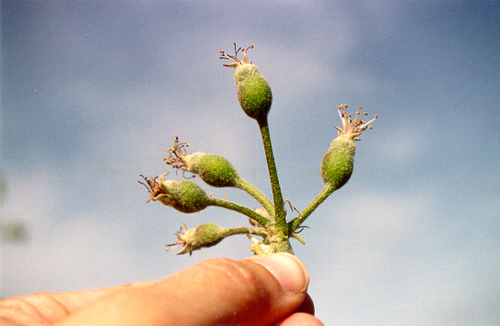 Blossoms that have been pollinated are now developing into fruitlets and are rapidly growing in size. At this time of year, the amount of fruit that will continue to develop is evident and provides us with an opportunity to determine if fruit thinning is needed. Last year, as a result of the freeze during bloom in many parts of Maine, few fruit occurred. This lack of fruit leads to an abundance of flowers in the following spring, a phenomenon known as biennial bearing. Many orchards can expect an abundance of fruit this year. Fruit trees that bear many fruit are said to “carry a heavy crop,” a condition that will slow the growth of the tree, and in the case of peach, will limit its ability to develop winter hardiness this fall. Other consequences of a heavy crop are small fruit that ripen more slowly, and limbs that break off from too much weight. Fruit thinning is a method to reduce the number of fruit on a tree and to counteract the negative effect of a heavy crop. In most cases, it is done by hand. June is the best time for hand thinning of fruit, but it can be done any time during the summer. The number of fruit to remove depends on the type of fruit and how many fruit the tree currently bears. 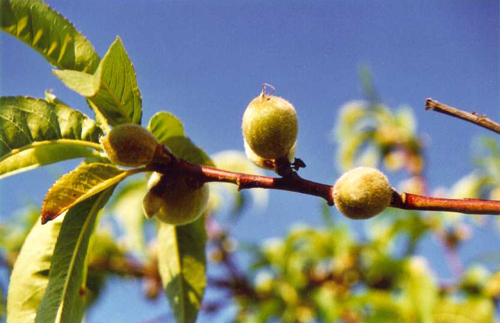 Apples, pears, and plums bear fruit in clusters whereas peaches and apricots bear fruit singly. Where fruit occur in clusters, they can be thinned so that only one remains within each cluster. They can be further thinned so that each fruit is spaced 6 to 8 inches apart along the branches for apple and pear, and 4 to 6 inches in the case of plums. Peaches should be thinned so that fruit are spaced 6 to 8 inches apart and apricots spaced 4 inches apart. This may entail removing a large number of fruit, but will encourage better fruit growth and ripening in the fruit that remain on the tree, and prevent some insect damage that occurs later in summer. After fruit thinning is complete, fruit can be cleaned up from beneath the tree to reduce the incidence of disease and insect predation. Cutworm. Photo by Charles Armstrong. There are several different types of cutworms. They can be categorized as surface, climbing, army or subterranean. Because of their many similarities, it is difficult to tell one species of cutworm from another. In New England, many cutworms have one generation per year. Some can produce two or more generations. Most of the damage by cutworms is noticed in the spring and early summer. Cutworm caterpillars kill or set back plants by feeding on the roots or stems. Cutworms seem to favor corn, peppers, tomatoes, cole crops, and beans. The larvae are nocturnal, hiding underground during the day. Cutworms overwinter in the late larval or pupal stage. The moths may appear soon after the spring temperatures begin to rise. The moths harbor in weedy areas, especially if mustard or quackgrass is present. The moths fly at night and lay their eggs in the soil. Once the garden is planted, the young larvae feed on small roots until they are half grown. They are more likely to cut off plants at ground level as they grow. The thick-bodied larvae are normally dark in color and will curl up in to a “C” when disturbed. Try a nighttime stroll in the garden to find these pests. A flashlight covered with red transparent wrap will be helpful in spotting nocturnal pests. The red light does not warn them of your coming. Protect seedlings with a collar made from cardboard or plastic. Paper cups, yogurt cups, 1/2-gallon milk cartons or jugs work nicely for this purpose. Trap the cutworms with a bait of cornmeal or bran meal. The cutworms will die of overeating as the meal swells within them. Place a toothpick, small stick or nail upright beside the stem of each seedling. The cutworm will be unable to wrap it self around the plant. Sprinkle diatomaceous earth or wood ashes around the base of the plant. The sharpness and dryness of these materials create a barrier that cutworms don’t like to cross. Cutworm resistant varieties are available for some beans. Encourage natural predators such as birds or bats. Bacillus Thuringiensis (Bt) can be effective on some species of cutworms. The smaller the worm, the more effective the Bt. Insecticide dusts (Sevin or spinosad) applied around the base of the plant may be effective. Always read and follow the label directions when using pesticides. For more information, see UMaine Extension fact sheet #5015, Cutworms.